What Is Ballpoint Pen Ink Made of? Ballpoint pens may seem simple and mundane, but each one is the result of more than 100 years of hard work and research by curious individuals, dedicated chemists and business owners. It may not look like much, but the tube of ink inside your pen took decades to refine: It’s more complex than you would expect from something so small. Companies such as Bic, Pilot and Paper Mate keep their exact ink formulas well-guarded, but almost all ballpoint pen inks consist of one or more color pigments or dyes dissolved or suspended in a solvent – usually oil or water. Additional chemical compounds such as oleic acid and alkyl alkanolamide are added to make the writing process easy. They keep the ink flowing from the pen and absorbing into the paper, and they make the colors vibrant. While the first ballpoint pen was invented in 1888 by an American leather tanner named John Loud, it would take almost 60 years of attempts for the pens to catch on and become popular. It all came down to the ink. The structure and basic functions of ballpoint pens have remained consistent over the years, but without the correct ink composition, the pens would leak, clog, fade or smear. It took decades to find a formula that would make ballpoints more efficient than the fountain pens that preceded them. There are hundreds of variations on ink formulas. The average ballpoint pen’s ink is composed of dye or pigment particles – carbon black for black pens, eosin for red, or a suspected cocktail of Prussian blue, crystal violet and phthalocyanine blue for the classic blue pen – suspended in a solvent of oil or water. The most common of the oils are benzyl alcohol or phenoxyethanol, which mix with the pigments or dyes to create a smooth, vibrant ink that dries quickly. However, there is more to ink than its two primary components. With only pigment and solvent, the pen works, but it could still use some improvements. The fountain pens that preceded ballpoints used a thin, water-based ink, and they hinged on gravity to feed ink down to the pen tip. They had to be held at specific angles and used with care; otherwise, the mechanisms would break or the ink would smear. The development of the rough ball in the early 1940s by Hungarian brothers Lasdislas and Georg Biro (whose names are still on certain Bic pens) solved the gravity problem when paired with a thick, oil-based newspaper ink. It wasn't until 1949 that Fran Seech developed what would become the modern pen ink formula that made Paper Mate pens so wildly popular. It took more than color and solvents. The specifics are a well-kept secret, but a number of chemical additives are mixed into ballpoint ink formulas to improve their quality and make the pens easier to use. 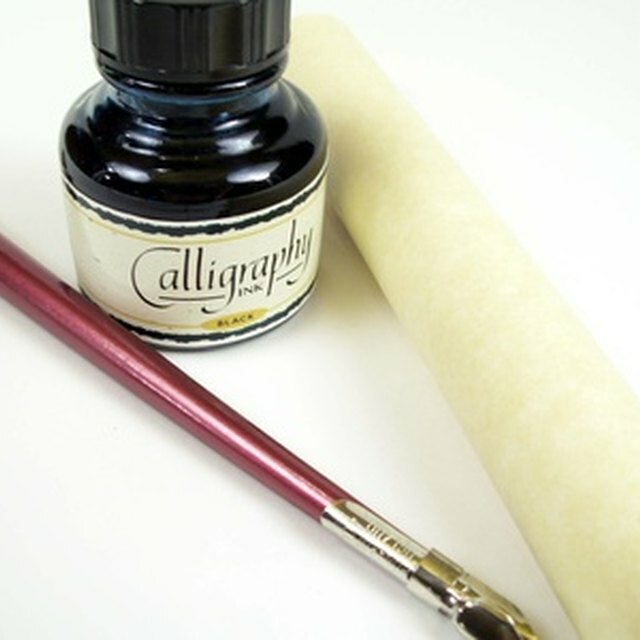 For example, fatty acids like oleic acid keep the ballpoint lubricated to avoid clogs, and surfactants such as alkyl alkanolamide ensure that the ink absorbs into the paper before it dries. These additives come and go as ink chemists develop new and more effective formulas each year. Gizmodo: What's the Ink in a Standard Rollerball Pen Made Of? Flournoy, Blake. "What Is Ballpoint Pen Ink Made of?" Sciencing, https://sciencing.com/ballpoint-pen-ink-made-of-10036405.html. 26 April 2018.